Simple Inked makes it easy for you to see your clients who didn't rebook. It also takes it a few steps further by allowing you to filter the search to look at client's who came in for a specific service or service category, and didn't rebook for that same service or service category. We'll take a look at an example to help you understand how it works. We'll look up our clients who came in for an Half Day Session service between a select date range, but didn't rebook in their next Half Day Session appointment. As an overview, we first want to see all the clients who came in for an Half Day Session, and who rebooked for any service. 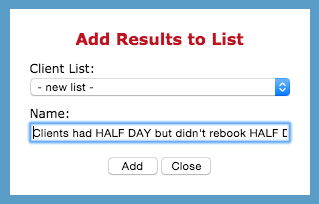 Once we create this list, we can remove the clients who did rebook for the Half Day Session service to leave behind the clients who didn't rebook their Half Day Session. First, we need to find our clients who rebooked for any service. Go to Marketing and click the Clients who Rebooked button. On the right side panel, change the date range. You can use the With Operator: drop down menu if you would like to target a specific operators rebooks, however in this scenario we will look at all operators. 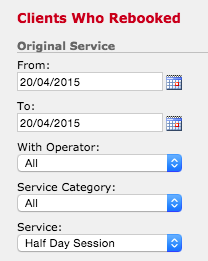 Use the Service Category: and/or Service: drop down menus to pick the service/service category you wish to look at. This is what the clients came in for. 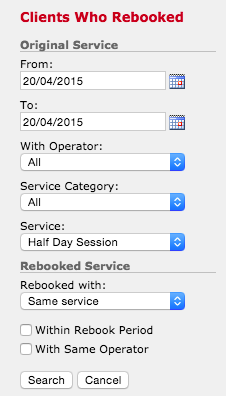 Now to select what the clients rebooked for, and in this case we're going to select Any Service, and click Search. Here are the clients who came in for a Half Day Session service, and rebooked for any service. We want to Add To List, give the list a name and click Add. We are going to use this list again shortly to remove some clients from it. Next step, finding the clients who had Half Day Session, and did rebook their next Half Day Session appointment. Go back to Marketing, click Clients Who Rebooked and fill out the details on the right. First select the same date range you chose before. Pick the same Service Category you chose before. Pick the same Service you chose before. Pick the Same Service option this time, and Search. Here are your clients who had a Half Day Session and who also rebooked for their next Half Day Session appointment. These are not the clients we wish to target, but rather we want to see the clients who didn't rebook for their Half Day Session. Therefore, we need to remove these clients from the list we just created, which will leave behind the clients who haven't yet rebooked for their next Half Day Session. Click Remove From List, and pick the list we created before. Here they are, the clients who came in for an Half Day Session between the dates you chose, but didn't rebook for their Half Day Session service. Now you can send them all an SMS or Email to remind them to rebook. You can use these same steps for all sorts of services, service categories, operators - the options are countless. If you have any questions, send them through via the Submit a Request button in your Help & Support page.